A caller asks about a skin condition of patchy dryness and redness and would like to know if there's an herb that could help. Susun asks if anything happened in his life when it started. He mentions eating Indian food, and taking anti-biotics. Susun says she thinks it could be the spicy food. She tells him to stop all peppery and spicy food and see if that helps. She also says to drink Nourishing herbal infusions, particularly comfrey and linden. This audio is just over 8 minutes long.
. It thrives in many places and is harvested from China to France for commercial sale. When linden blooms, its fragrance is so sweet that the bees flock to it. Their buzzing is the sound one must tune in to if identifying linden by sound. (I usually find them by smell!) When I harvest linden blossoms, I am careful to wait until after the bee has left the flower, so I don’t get stung. Bees abuzz and birds atweet, linden blossoms sure smell sweet. Linden blossoms hang from a green strap-like structure that looks a little like a leaf, but isn’t. The green structure is part of the remedy and needs to be harvested along with the cluster of flowers dangling under it. Lowering inflammation is key to achieving a happy, healthy old age. Toward that end, I drink at least two quarts of linden infusion a week. I believe that most chronic diseases are the end result of inflammation. Joint pain is inflammation. Dementia is inflammation. Blood vessel disease is inflammation. And adult-onset diabetes is inflammation. It seems to me that many cancers are a response to inflammation too. A recent study found women who taken NSAIDs regularly are less likely to be diagnosed with breast cancer. Linden is the world’s leading anti-cold and anti-flu herb. It prevents and heals all respiratory distresses (but is not an anti-infective). It is a cooling and strengthening herb. Linden is considered safe for children and elders. Linden is primarily used as a tea, though I prefer the curative powers of a strong infusion. I use one-half ounce of linden blossoms to a quart of water and steep for four hours. I strain off the first brew and refrigerate it, then rebrew the wet linden flowers by adding two cups of cold water to them in a saucepan. I bring this rebrew to a boil, cover, and let sit for four hours to extract the healing mucilage that is triggered by the cold water. Linden flowers are the usual medicine, but the leaves are medicinal as well. They are heart-shaped and even more mucilaginous and anti-inflammatory than the blossoms.. A student who had been kicked by a horse found relief from a nasty wound (already more than a week old) by applying chewed up linden leaf. If I didn’t have so much plantain at hand, I am sure I would use more linden leaf poultices. Linden grows well in cities; I have rarely been in a city in North America or Europe that does not a Linden Avenue. A highlight of my love affair with linden come with a visit to Linderhof in Bavaria. The day I got there, the three-hundred-year-old linden tree was blooming and buzzing and throwing off a scent that made me swoon with delight. My local lindens are tall at fifty feet. This giant was over a hundred feet. A caller on blogtalkradio says he had surgery on his neck and back and is still in pain. He asks if Susun has any suggestions. 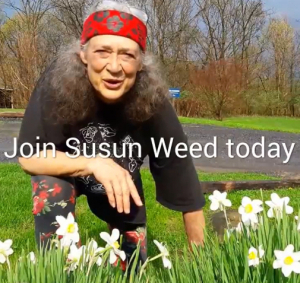 Susun recommends comfrey leaf infusion works for restoring health, strength and flexibility to bones. This audio is just over 6:00 minutes long.